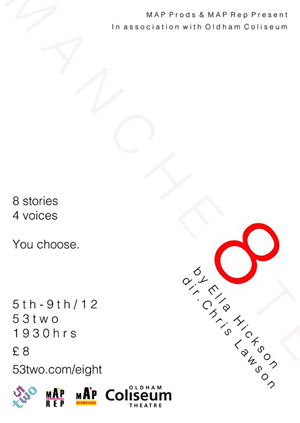 Eight is a collection of monologues by writer Ella Hickson. The 'catch' with this presentation however is that the audience are asked to vote for which 4 of the 8 monologues they would like to watch before they enter the auditorium. We were given a short breakdown of each character and in true political fashion, asked to put a cross in the box next to our choice, and then deposit the voting paper in a box at the box office. Those with the most votes got to perform that evening. This evening however, there were 9 actors, not 8, and we voted for 4 monologues and saw 5. On entering the auditorium, the stage had been altered into a thrust configuration - audience on 2 sides with a walkway between for the action to take place in. The 8 actors were sat motionless on the opposite side to the main entrance. The set was minimalist and had that 'drama school studio theatre' feel about it. One large black box centre stage and two smaller ones either side. The set remained constant for all monologues. This evening the first monologue to be presented was the story of a 17 year old school boy's first sexual encounter with an older women in the South Of France. A coming-of-age story which was well thought through and the acting was real and believable by Simon Hallman, though the story said nothing new. The monologue was a little long and was quite repetitive and also really somewhat predictable. Next up was Darren Jeffries, playing Miles, a successful US financier whose life is turned upside down when, after giving a young Muslim youth some money to buy a chocolate. He then sees the same youth on the bus with him just before he detonates a device which kills many on the bus, and leaves Miles' life in tatters for the next three years. An interesting and fresh perspective on a what is now common subject, and played very sensitively by a believable and empathetic actor. The third monologue came from this evening's only female participant, Charlie Young, who was Bobby, a single mum of two youngsters who is sacked from her job just three weeks before Christmas. She finds employment by helping an elderly lady with her daily chores. The differences between her own life and that of the elderly lady makes for a startling contrast and she becomes both embittered and emboldened by what she sees. Young would definitely have benefited from either a dialect coach or changing the location / accent of her monologue since her Scottish was sadly never quite right, travelling the length and breadth of the country and other places too. Her acting however was good and believable, and the first of the pieces to include any humour, which came as a welcome relief. The last of the voted-for monologues came from young actor Abraham Tiyamiyu, as a young man who looked up to his father and enlisted in the army. On seeing active service at the age of 22, he takes a bullet in the leg, leaves the army, and when home goes back to his love of the gym. When fit again he starts work in a mortuary, finding solace and comfort in 'befriending' the bodies that pass through. An interesting idea, underdeveloped and sadly the weakest link of the set. Finally, in walks Andre, a flamboyant artist in the mode of Grayson Perry. Dressed in kilt, jack boots, cravat and a long wig, he certainly stood out, and that was his intention. A great mix of comedy and tragedy as he describes his relationship with his boyfriend / lover whom he has just found hanging from the rafters with his scarf, too late to save him. Played superbly by Jake Ferretti this was the unexpected highlight of the evening. A soupcon of charm and a whole dollop of egoism melted down to a very real and sad portrayal of this young man who longed to be like his dour, normal, beige-wearing partner. The whole evening lasted about 80 minutes non-stop, and all the monologues were directed by Oldham Coliseum's Associate Director, Chris Lawson. I am not so sure that I liked the idea of having the 8 performers sitting motionless on the sidelines and not even them knowing who will be next or whether or not they had been voted for. I don't know how it could have been done differently, but it seemed a little unnecessary and unfair on the four who had to sit there throughout. The one thing I didn't enjoy about the directing however was that much of this evening's performance was played by the performer staring out in the direction of the other cast, meaning that those audience members behind them saw far too much back-acting. This was most obvious in the second and third pieces. Otherwise it proved to be a most interesting and different evening's entertainment; thought-provoking with a dose of comedy thrown in for good measure.